I got out of bed to go to the restroom at 11:30 pm on Monday January 28, 2013 (my due date) and my water broke. It wasn’t a huge gush, so I waited a minute or two to make sure. I called to Brian from the bathroom that my water broke. He said “you are joking.” I said I was pretty sure it broke. He said “this baby would want to come in the middle of the night!” I called Labor of Love to find out that Andrea was on call. I spoke to her and she was at the home birth of a personal friend, so Michelle was going to be meeting me at the birth center. This made me really happy because Michelle had been my favorite midwife, and I had only met with her 3 times during my pregnancy, including earlier that day. We agreed to meet at the birth center at midnight. Brian and I beat Michelle there. She apologized to us for being in her pajamas and said she would change once we were all set up inside. I thought that was hilarious because we, of course, did not care at all what she was wearing. I got checked out and they confirmed that I was 5 cm. My mom, sister Subrina, mother in law and my best friend Amber had all arrived by that point and we were instructed to pretty much do whatever we wanted to keep me comfortable and to make sure that I kept drinking plenty of fluids. They asked me if I wanted to get in the tub and said to let them know in advance because it takes about 20 minutes to fill it up. They suggested that I wait at least a little while because they didn’t want my labor to stall. The tub was really very nice. It did not really dull the pain like I was hoping, but allowing my arms and legs to float between contractions was surprisingly relaxing for me. I just lie there in the tub for a long time. Brian had a basin of cold water and wash cloths that he kept reapplying to my head and chest so that I wouldn’t get too hot. I had my eyes closed the entire time, so I didn’t actually know what time it was, but according to the paperwork it was 2:40 AM when I started pushing, kind of involuntarily. At that point, Brian changed his clothes and got into the tub with me. Everything felt very intense at that point. I was making a lot of noise to get through contractions, which is NOT typical for me. My hands were weirdly cramping up and my mom and Brian were massaging them for me to try and get me to relax some. After I had been pushing for awhile and his head was still not visible I started to think “what the heck is happening??! He is NEVER coming out! !” My mom told me later that she was sure that he would be born by 3:00 and when he wasn’t she started to thinking something was maybe wrong. Brian sat on the seat in the tub and I leaned up against him and pushed for what seemed like forever. He continued to tell me to push, that I could do it and kept rubbing my arms and my belly and kept rewetting the cold wash cloths on my head and chest. After I pushed for what seemed like forever, part of Emmett’s head was finally visible. It felt MUCH bigger than Linley’s head and I had to push so much harder than I ever had to for Jackson OR Linley (And Jackson was sunny side up!) Finally he was crowning and it took another 2 or 3 pushes just to get his head out. It is a really bizarre feeling to have just a baby’s head out of your body without it immediately being followed by their body. The student midwife, Katie, checked around the neck for the cord, but it was clear. Then they told me to push and Katie tried to help get him out. He was not moving. I screamed “just pull him out! !” and they told me that Katie was trying. Michelle gave Katie another couple of seconds, asked her if she had it Katie said “no” and Michelle took over. She told me to flip over onto my hands and knees in the tub, which I did with some help. But that raised the baby’s head out of the water so they told me to absolutely NOT let it go back in the water. One push in that position and Michelle told me I had to get out of the tub. Brian and my mom somehow lifted me out of the tub and onto the floor. Standing there, Michelle told me to push again. I said “I can’t push! !” Everyone told me that I could. I pushed, Katie lifted up one of my legs, Brian pushed on my belly and Michelle reached in to try and grab a shoulder without breaking it. Didn’t budge. At that point, my mom had Subrina leave the room, I could hear my Mother in law just sobbing and Brian was just sitting there silently terrified. Next I had to flip over onto my back on the floor. Brian held one leg back, Katie held the other one and again, Michelle reached inside to try and pull Emmett out. I pushed and cried and screamed like I have never screamed before. Still, would not come out. Again, I had to flip over to my hands and knees and do anything possible to get this baby out. That last push had to be the absolute worst pain I had ever experienced in my life. But, this time Michelle was able to reach Emmett’s shoulder and guide him out. Sweet Emmett Timothy was finally born at 3:57 am. It is amazing how immediately the pain goes away once the baby comes out. The whole process from the time his head was out, til his body was out was only 5 minutes, but it felt like an eternity. At this point, they laid him down on the ground and he looked pretty bad. (Thank God, I was facing the other way on my hands and knees still and could not see this, I think it would have been too much for me to take) Everyone said he looked very lifeless, but they just kept remembering that his heart beat was nice and strong the entire time. It was really only about 30 seconds before he started crying, which was the absolute best sound I had ever heard in my life. I still couldn’t see him, so I also could not see that there was a small tear in his umbilical cord that was pulsing out blood and mixing with the water on the floor making it look REALLY dramatic in there. Michelle had already told us that she was not going to cut his cord because she wanted him to get all that blood, so my mom grabbed the cord and applied enough pressure for it to stop squirting out, but still letting it pulse. They gave him 2 puffs of oxygen from a mask to help open up his lungs and then they helped me turn over and I finally got to hold him. He was SO big and so purple… his whole head was bruised from being stuck behind my pubic bone for so long. After I held him for about 5 minutes, Brian took him out to the other room so that I could deliver the placenta without an audience. Sweet Michelle got pillows and stacked them behind me and let me lie back on her to deliver the placenta so I didn’t have to get up and move and so I didn’t feel like I was laying there totally alone. At one point, Brian walked back in with Emmett and looked at me there and just started crying. It was a really difficult and emotional experience for him. 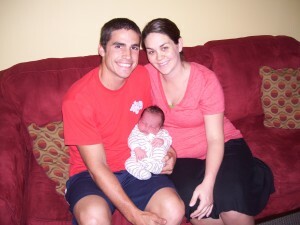 Once the placenta was out, they told me they weighed Emmett… 10 pounds 11 ounces! Oh my gosh!!! No wonder he wouldn’t come out without a fight!! I got up and got in the shower because I was pretty much just covered with blood and whatnot. I obviously had to have help cleaning myself because I was so exhausted. When I got out of the shower, Michelle had to inspect my tearing. She was really worried that I would have a third degree tear, or that my sphincter would be torn, which would require transferring me to the hospital for a surgeon to repair it. Miraculously, I just had a second degree tear. It was pretty substantial, but just second degree. Thank the Lord!! It was a pretty funny scene while they were checking me out. Michelle, Katie, and the nurse Sady were all down there inspecting things… Katie was even holding a flashlight. I kind of wished I would have taken a picture from my point of view, it was hilarious. Overall, my labor was only 4.5 hours from the time my water broke until Emmett was born. It felt a lot longer! This labor experience was much different than Jackson and Linley. It was far more intense, painful, and scary. But it was also an experience that made me really marvel at my body and really made me rely on other people (which I have never had to do in labor before, and did not expect) and tied me emotionally to everyone there, especially the midwife, Michelle, and Brian. I am so beyond happy with my decision to deliver this baby at a birth center. I fully believe that it is EXACTLY where we were supposed to be. I believe that God 100% had a hand in appointing the right people to be there to support me through the hardest night I have ever experienced. Michelle was not supposed to be there that night, but circumstances out of her control made her be the one to facilitate this birth. She took charge when she needed to, she spoke in a way that made me know that I needed to do what she said, but that did not scare me or make me feel like anything was out of control at all. She cared for me more than I would have ever expected. Katie was very gentle with me and held it together beautifully, even though I know she had to be scared, too. My mom was amazing. She was crying when I was in the tub, before I was even pushing, just with sheer excitement and anticipation of Emmett’s impending arrival. But when things got serious, she did not fall apart, she jumped right in there and did anything she could to help bring my baby into the world. Brian was so much more incredible than I would have ever known had the birth been different. He sat in that tub with me (which is saying a lot considering the amount of nasty things that were floating around in there) and quietly encouraged me and gave me strength that I didn’t think that I had. He lifted me, soaking wet, with our baby’s head already delivered out of the tub and put me on the ground and was right there with me telling me that I COULD do it. I am so grateful to have had this experience. I feel so connected to him in a way that I could not have imagined before. It is truly incredible. I will never stop singing the praises of Labor of Love Birth Center or specifically of my midwife Michelle. She was seriously a rock star through the whole thing. It was such a warm and loving environment to bring my child into. I want to have another baby there because it was so amazing for me. I’m sure there is much more that I could say, and I’m sure over time I will think of things to add to this story. Emmett is 9 days old now and I already feel like some of the details are getting fuzzy. I already am having a hard time recalling the extent of the pain that I felt, or how horrible it was to wait for him to cry, or how scared Brian looked. What I do know is, despite a birth that most people would probably call traumatic, I just think it was beautiful and amazing. I am totally overcome by emotion every time I think about it and I hope that feeling never goes away.